This post consists of some of a series of photographs that first appeared on my photography blog, which is now closed. I am now amalgamating these photos into Travel Tales where the series will appear in future. 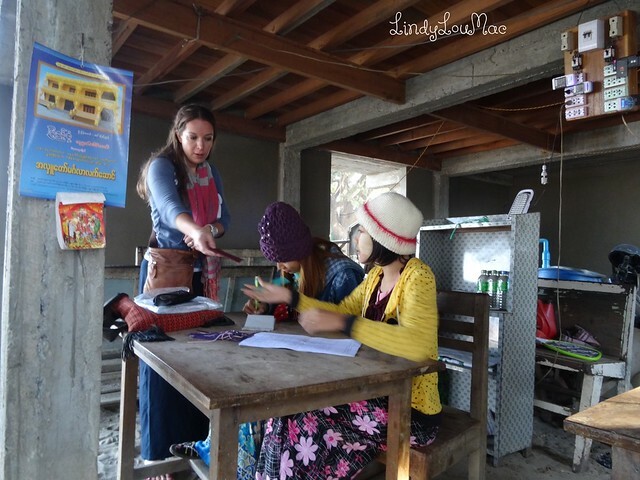 If you wish to view earlier photos from other countries please visit LindyLouMac's World in Photos as today I have just reposted those from Myanmar. I was fortunate to visit this fascinating and beautiful country recently and I came home with thousands of photographs, plenty of material for this regular Friday post. Are you grateful not to have to carry your shopping home like this? I certainly am, although I am sure it would be good for ones posture! Those of you that read my Travel Tales blog will know that at the moment I am posting about a trip to the beautiful and interesting country of Myanmar. The people are very friendly and I added many people portraits to my collection. Today for Faces on Friday I feature another portrait from Myanmar, a Monk at the Shwedagon Pagoda. This lovely smiley gentleman approached my daughter and me, as Westerners we soon discovered that the Monks love to chat and use their often excellent English. We had a long chat to this one and he was more than happy to pose for us. Those of you that read my Travel Tales blog will know that at the moment I am posting about a trip to the beautiful and interesting country of Myanmar. The people are very friendly and I added many people portraits to my collection. Today for Faces on Friday I feature another study from Myanmar, ladies hard at work cleaning the marble at Shwedagon Pagoda. During our travels in Myanmar we often saw ladies smoking cigars, technically Cheroots, as they are a cylindrical cigar with both ends clipped during manufacture. During our visit we did in fact on another occasion see them being manufactured, but I will save those photos for another post. Although also smoked in other countries cheroots are most commonly associated with Myanmar by the British, maybe because smoking them was so widespread in the colonial days. They also feature in George Orwell's novel Burmese Days and Kipling's Mandalay. The photo I have shared today was taken during a visit to Maha Muni Pagoda .
. Portraits of lovely Burmese people from youth to maturity. A couple of weeks ago for my World at Work feature I posted photos of the famous Star Ferry in Hong Kong. 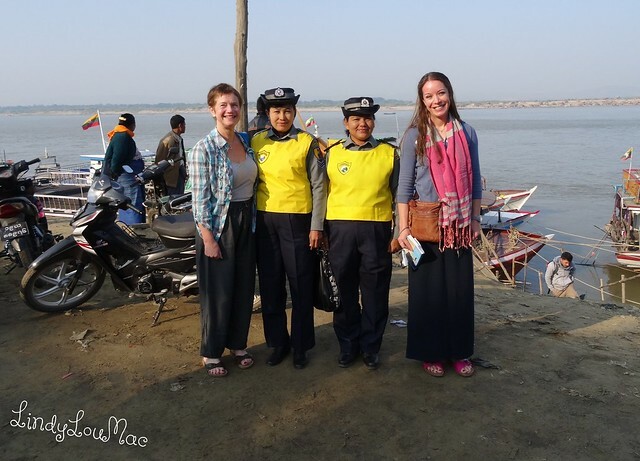 I came across this photo when I was writing the next post for Travel Tales which is about a trip to Mingun from Mandalay. It struck me just how very different the World of Work is for these young ladies in comparison to those Hong Kong Ferry Sailors. 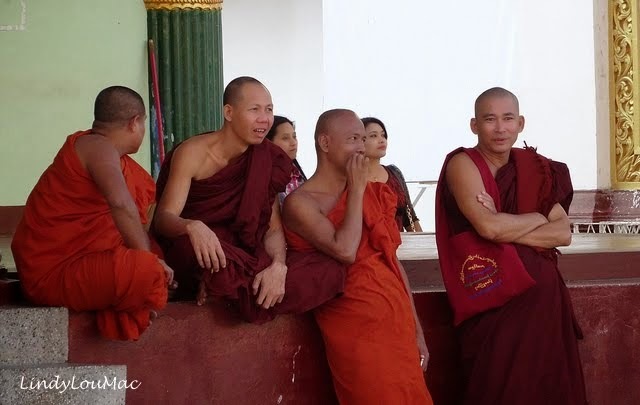 In Myanmar there is a long tradition of temporary ordination of Buddhist monks and married men can traditionally return to the monastery from time to time, provided they have their wives' permission. As seen in this next photo, where the wife and daughter are proudly walking along behind this monk. This photo previously appeared in my post entitled Yangon - Further First Impressions of Myanmar - Burma on my Travel Tales blog. Young lovers enjoying lunch in the park in Yangon, Myanmar. These photos were taken during my trip to Myanmar over Christmas and New Year 2013/14. Yes still sharing photos from this fabulous trip one year on, I took so many! As mentioned above, I will be continuing with this series here on the Travel Tales blog, but I doubt it will be every week! I hope you my readers will find these posts of interest.